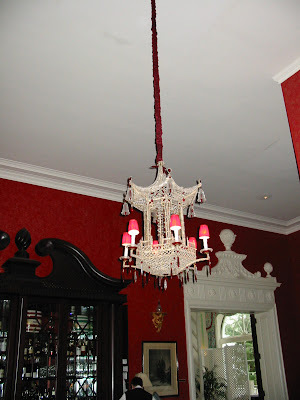 Last month, when I posted my Greenbrier blog post I got a Facebook note from Tammi over at Couture Window Fashions. 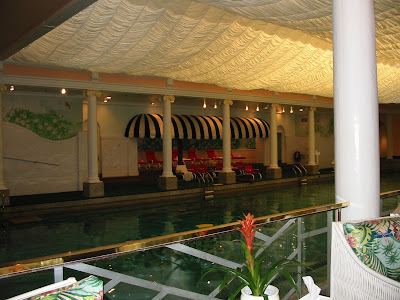 She told me she was going that weekend to visit her Dad who lived nearby and asked me if I wanted any particular photos taken of the Greenbrier. How incredibly COOL was that? First, I have to include this photo of her, her skirt fits in perfectly doesn't it? 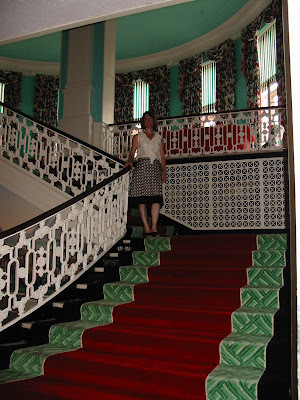 I think we can all agree that Dorothy Draper was not afraid of color and big prints! 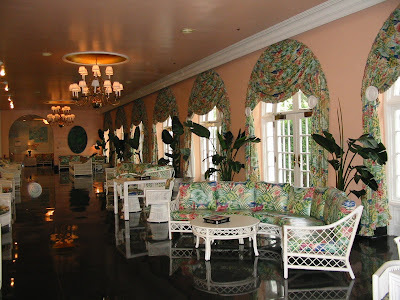 Check out all the details in just this picture....I would say that chandelier is an original to The Greenbrier wouldn't you? Love the shiny floors...I think it would be hard for me to resist wanting to run across in socks. 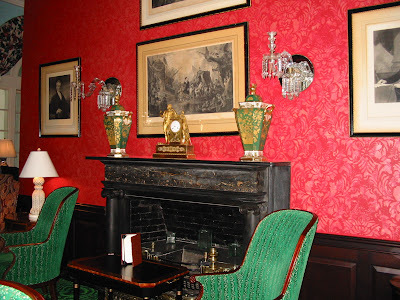 This is the entrance to the Draper's Cafe, I just love looking at all the details, that coat rack is yummy isn't it? 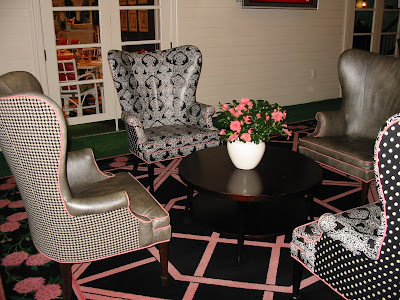 I love the pink welting on all of these chairs, I think I would've taken the same picture. 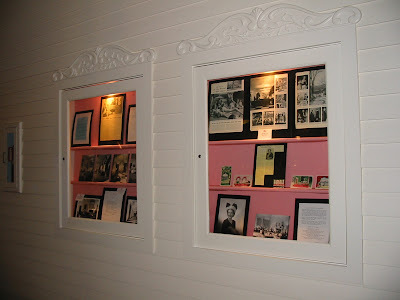 I am looking forward to seeing this wall and all the black and whites of the resort's past. I just love all these new social networking tools and technology such as Facebook. It's a great way of making friends and helping each other out, THANK YOU again Tammi! How cool Marie! LOVE IT! Yes, there is so much eye candy for you to look at I know you will enjoy it there. Wow amazing!! Love the pinks and all the mix of texture and color.Thanks for sharing. Amazing! 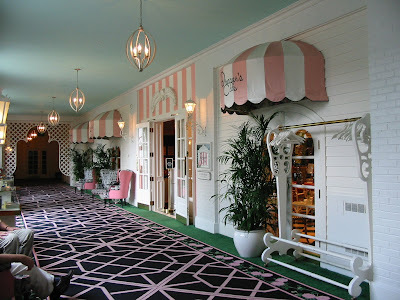 My fave details are the broad stripes--both the black and white in the cabana and the pink and white outside the cafe. Fabulous! I took a picture of the paint chips from that case and used them in my house! Great photos... 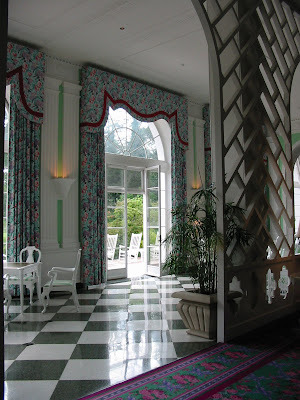 The Greenbrier is gorgeous!